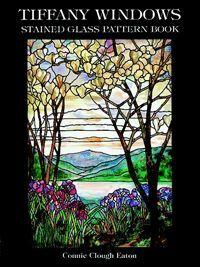 Designs consist of landscape and memorial windows, panels, transoms, skylights, glass screens, and other stained glass projects. Patterns for "Pumpkins and Beets," "The Deep Sea," "Sir Galahad," "Sunset," "Peace," many others. Also practical for varied craft and coloring activities. Includes: 60 lovely, royalty-free designs adapted from authentic Tiffany creations.